Dougs and Indi met each other in the city but both grew up in the country. So what better place to get married than out in the little country town of Glen Innes. The connection they have because of their country roots is something special. They both hope to move back to the country soon, and why not I say, it’s beautiful out there, calming, and where these two lovers are most at home. India’s awesome Gold pumps are by Aquazzura and her gown is by Yulia McAuley Couture, I have never seen a dress like it, stunning! Guys thank you for having me along, for being so hospitable and so relaxed on what was such a huge day! Hope you like this sneak peek of what is to come keeps you happy for now. 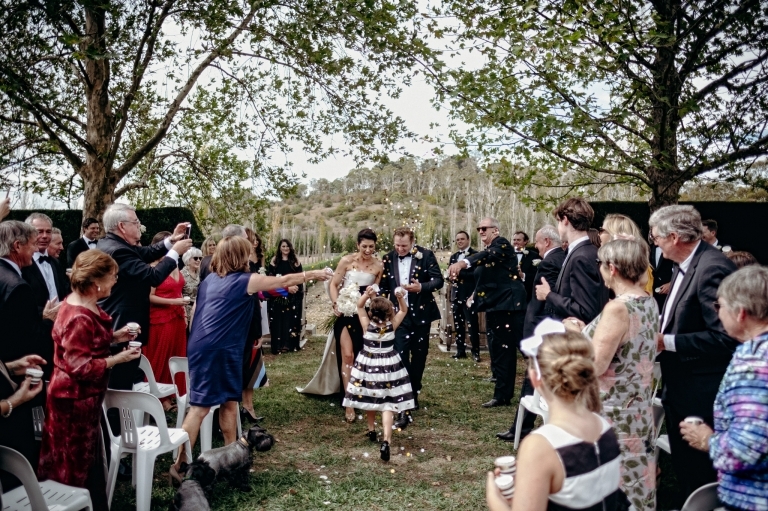 Glen Innes was and epic location for a country wedding, but if by some chance you are looking to have your upcoming wedding in our local area of Byron Bay, there is a great feature we have done on some of our favourite venues, just over HERE. Please, do have a look. As a Byron Bay Wedding Photographer it doesn’t get more amazing than the day Joanne married Mike, on Clarkes Beach in Byron Bay. We had sun, clouds, rain, sun, sunset, waves, magic light, these two are blessed. The always charismatic Ben Carlyle kept the spirit high as the rain came down in the ceremony. Everyone held strong though and the clouds passed. We took a stroll down the beach for a few pics after the ceremony. We managed to find some rocks with the waves crashing in the background, it made for a stunning backdrop. After the sunset, everyone partied the night away at Beach, Mike strutting his skills on the guitar. It was all one epic rollercoaster ride. Jo and Mike, thanks for having Hannah and I along on your day in Byron Bay. If you are looking to have your upcoming wedding in Byron Bay there is a great feature we have done on some of our favourite venues, just over HERE. Please, do have a look. Talin and Narbs are no longer two people, they are ONE! 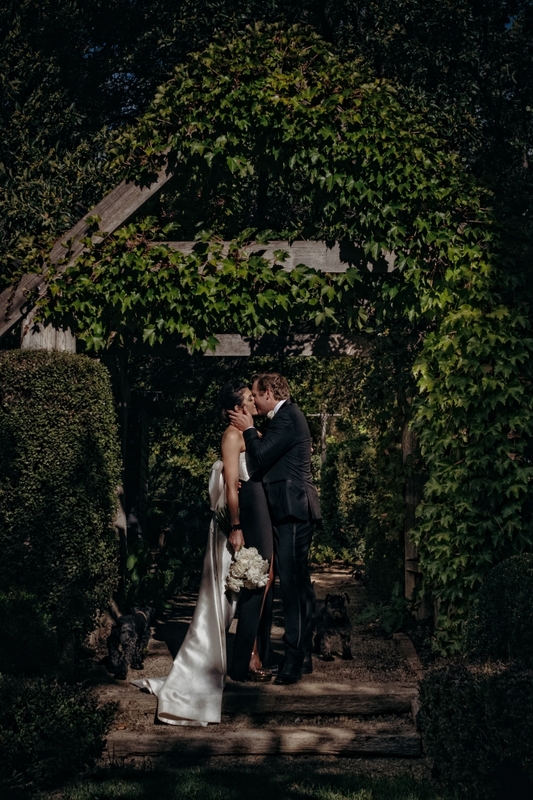 They married each other on a stunning property, The Somersby Stables, in Somersby NSW, what a place!! The huge barn was seriously decked out with flowers galore, by the very talented Piccolo Petalo, there will be more to come of that later. Talin and Narbeh joined with vows that were both humorous but also brought us all to tears. Kind words said by a dear friend of theirs who married them all but a few legal must gets. I love these two, so kind and thoughtful, always worrying about everyone else instead of kicking back and enjoying their huge epic ride that was their wedding day. But lucky Pete and I were there to snap a few pics of the day in case they missed anything. Talin is wearing a very elegant Alyssa Kristin gown from Love Marie Bridal Boutique and Narbs looked very dashing in his perfectly fitting blue suit by Brent Wilson – what a perfect match! So much love too, and romance, and the weather was superb. Thanks Sydney for putting it on for all of us on their special day! Everyone partied the night on in the barn, lots of Armenian charm on the dance-floor, and the food by Sprout was soooo darn good! Thanks Talin and Narbs, for having Pete and I along, and for being so hospitable, it was a lot of fun! A few pics here of the day, an attempt to show off the intensity and love of your day, more to come soon. Somersby is one beautiful location that’s for sure, but there is also a great feature we have done on another epic part of NSW just over HERE. Please, do have a look. Talin Abovian - So, so, SO incredibly chuffed and honoured to have had the pleasure of meeting, working with and being shot by Matt and Pete. Holy moly – what truly amazing photographers, and they took all the time to not only snap the day but also to scout out the perfect locations on the property, getting just the right shot at just the right moment. I mean, the one on the lake – breathtaking. Last weekend Rachel and Alex were married in a very beautiful part of the world, up in Villa Vivanté, a stunning spot all the way up on the top of the Coffs Harbour hilltops. Along side them were their two beautiful little girls, gum-nut babies! Rachel and Alex chose a first look up at the Villa. Alex was in shock as his stunning bride Rachel walked down the stairs to him. We were able to sneak away down to the beach for a couple of pics, just the two of them in their lovely space, with each other. We then headed back up to the Villa for the very emotional ceremony, touching and charismatic words by Alison Bartlett. …and then of course, a huge party that went all night long. Thank you, Rachel and Alex, for the privilege of being able to be a part of your epic day in paradise. More of the whole wedding, and some of the best Coffs Harbour wedding photography I have seen, will be coming your way very soon, but for now a no doubt eagerly awaited few pics of the day. Also big thanks to Lauren from North Coast Luxury Weddings for putting on such an amazing day, the attention to detail you have is astounding. 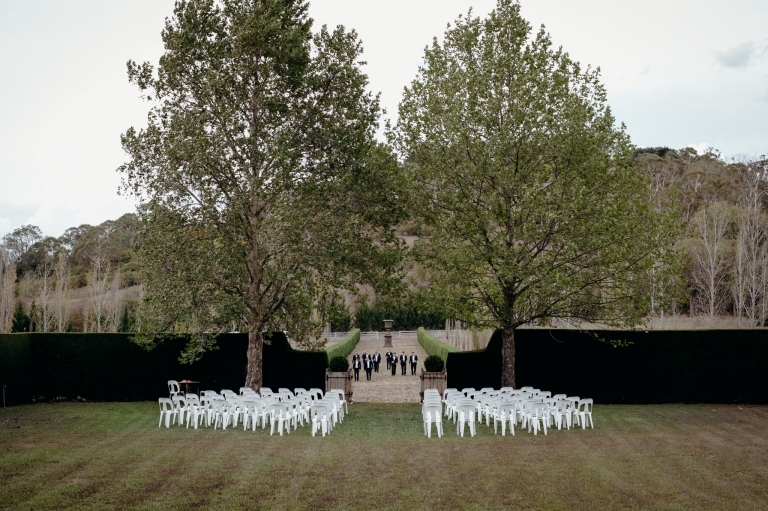 Villa Vivanté is one epic wedding venue that’s for sure, but there is also a great feature we have done on another epic part of NSW just over here. Please, do have a look. Rachel lamond - Without doubt, the best photography I’ve ever seen (I’m not biased). Matt, when I first visited your site I read your intro and knew you loved love and it shows in your work, you truly are a blessed artist and I am so grateful you shared your gift with us. There was lots of emotional tears all around, the rain made it such an intimate gathering. The Earth house in Clunes, Byron Bay gave us a spectacular backdrop with clouds rolling through the valleys off in the distance. Kirsty wore a stunning Grace Loves Lace dress and her elegant and very fragrant Bouquet was by the talented French Petal. The energy was high as the rain came down, thanks to the always charismatic Ben Carlyle. Everyone dined on lovely food by The Fig Tree and danced the day away to great tunes by North Coast Entertainment. Thank you guys and also to all your friends and families, for having Pete and I along on such a wonderful day. I hope these few teasers captured just a brief glimpse of what your day was all about. Robyn and Josh married last weekend on a glorious day in paradise, two wonderful lovers and soulmates. What more could a Byron Bay Wedding Photographer hope for! This was from Robyn and Josh after I thanked them the other day for having us along. Well, what can we say? Thank you seems inadequate but we sincerely thank yourself and Pete for your amazing effort last Saturday for our special day. You guys rocked! Thanks for making it easy for the both of us, because truth is we both hate photos (but love looking at them of course). We hope you both enjoyed your day with us and we can’t wait to share your work with all our family and friends (and whoever will look or listen! Hehe). So here are Pete and I again, at this breathtaking Earth House place. Thank you Munro for everything you do, Earth House really is a slice of paradise (actually, I think I might just start calling you ‘Sir Munro’ from now on)! BUT, this place is kinda EXTRA spesh to me…it’s where my sister Hannah and I photographed our first wedding together. Hannah usually shoots along side me but has recently had a baby. He’s Tex. He’s very cute, I love him to bits…etc, etc. Tex is a bit little yet and so Hannah wasn’t with me on this day, but our good friend, celebrant, Katrina Holt, (sporting a baby bump herself) was. And with such memorable elegant words Katrina bound these two lovers together. So a few little things like this, kinda gave me extra smiles on the day. Thanks Katrina!, Babies!, Babies all round! Babies aside, I would really again like to thank my friend and confidant, Pete. Your work is amazing, your support is priceless, plus you got me some photos a bit earlier than usual, hence being able to show off a few today! Robyn and Josh, no, really, thank YOU, for allowing us to be a huge part of such a special day. It is lovely, thoughtful, happy, thankful, and of course super cool humans like you guys, that not only make our jobs so very easy, but also incredibly satisfying and fulfilling. Big thanks also to all your friends and families, what a great bunch of people! I’ve decided to make this an extended teaser session, firstly to really say thanks again for those kind words you gave us, even before seeing any work we had done with you, and secondly also to show off some of Pete’s faves too. Robyn and Josh also wanted to mention the following people, who contributed to their perfect day….and I would also like to thank them as well, as a matter of fact! Mike from Goldbear was the Videographer, thanks Mike for another great day working along side you. The White Tree provided the awesome tunes. And there will be a few more to show off in the full blog of this….stay tuned. The Earth House is also featured in one of our recent articles on Byron Wedding Venues, it’s worth a peep.